Makita jig saw blades are made with high carbon steel, and are engineered forcreased durability. 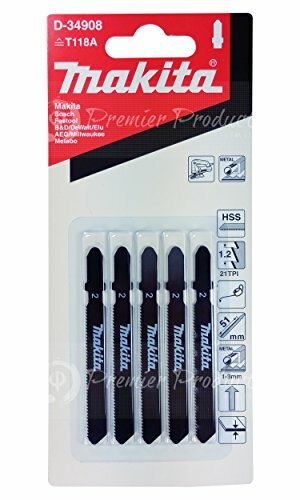 For use with jig saws that accept T-shank blades. Comes a convenient 5 pack of blades. Sold as Cd/2. 1-5/8", 24TPI. Makita shank. For stainless steel and tough plastic. Carded. Manufacturer's number: 723008-4-2. Buy Hardware Supplies SKU #: 28080. Country of origin: Japan. Distributed by Makita Usa, Inc.
Makita 792211-8-2: 9TPI, for scroll cutting, length 3-7/32 MAK shank. Quality steel and construction materials used in manaufacturing. 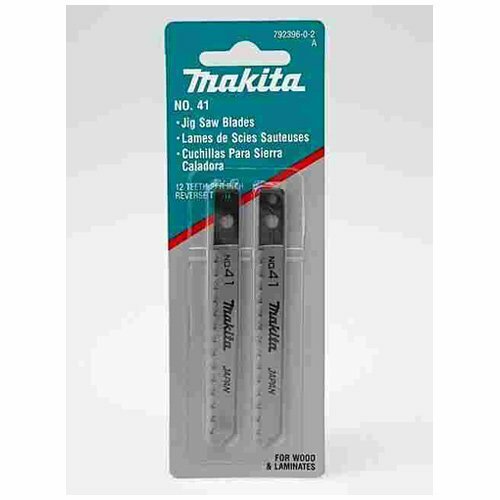 Makita Jig Saw Blades are made with high speed steel and are engineered for faster cuts. They are also designed for longer life than high carbon steel. For use with jig saws that accept a T-shank blade. 458-723009-2-2 Features: -For decorative veneers.-Applicable Materials: Plastic.-Coating: None.-Cutting : 2 3/8 in.-Shank Type: Universal. Are You Using the Right Jigsaw Blade?